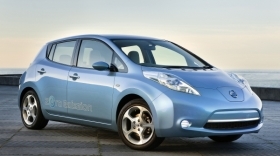 Nissan will aim its Leaf electric car at European markets that offer incentives. BERLIN (Bloomberg) -- Incentives to buy electric cars such as Nissan Motor Co.'s Leaf will “plunder” government treasuries and do little to reverse pollution, a coalition of German environmental groups said today. “A lot of money is going to be handed out to support electric cars instead of implementing tougher carbon-dioxide emissions (rules) and making gasoline and diesel cars more efficient,” said Juergen Resch, who heads the Berlin-based environmental organization Deutsche Umwelthilfe. Carmakers including Daimler AG and Volkswagen AG should focus on boosting fuel efficiency and lowering carbon emissions for vehicles equipped with combustion engines, Resch said. Electric cars often pollute more than gasoline or diesel vehicles factoring in emissions at coal and natural gas power plants that will provide the bulk of the power for the cars, he said. Powering an electric car using the existing combination of electricity sources in Germany, including coal and natural gas, means such vehicles emit at least 120 grams of CO2 per kilometer driven, the environmental groups said. That's more than Volkswagen's least-polluting Polo subcompact at 99g/km and Daimler's Smart ForTwo minicar, which has a carbon output of 88g/km. Each car is equipped with a diesel engine. Chancellor Angela Merkel is to meet May 3 with representatives from the automobile and energy industries in Berlin to discuss the future of electric mobility. Electric cars require “billions” in subsidies because they cost more and are unable to travel as far, Resch said. Nissan will aim the Leaf at European markets that offer incentives, such as Ireland where 5,000 euros (about $6,625) is available to people who purchase an electric vehicle. Financial support should be used on other projects like public transport, Resch said. Germany aims to have 1 million electric cars on the country's streets by 2020. None of Germany's largest auto manufacturers currently sell mass-produced electric cars, although Volkswagen said in March it wants to be No. 1 in hybrid and electric cars before the end of the decade. "The goal is to become the market leader in E-mobility by the year 2018," VW CEO Martin Winterkorn said in a statement. VW plans to launch full-electric versions of its Up minicar, the E-Up, the E-Golf and the E-Jetta in 2013.